What a day. Not only do we get our first look at a movie inspired by Spielberg, but we also get our first look at War Horse, the first movie Steven Spielberg has directed since Kingdom of the Crystal Skull in '08. The photo was debuted by the Daily Mail's Baz Bamigboye and it's really not much to see; we have updated with four more NEW photos, this time with the lead Jeremy Irvine. 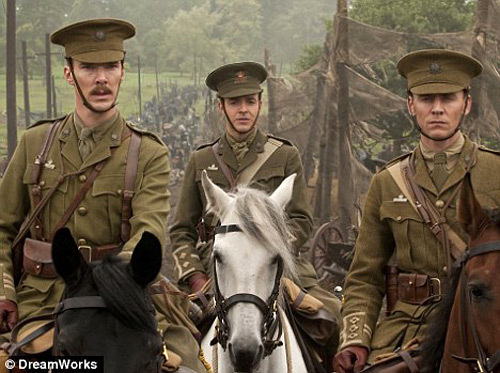 Seen L-R (very last photo): Benedict Cumberbatch ("Sherlock"), Patrick Kennedy (Atonement) and Tom Hiddleston (Loki in Thor) saddle up in Spielberg's War Horse. I'm actually excited to see Spielberg tackle a WWI story. Check this out below! Update: Since this news first hit, a huge batch of official photos including the lead actor and the lead horse in the movie, have shown up online via The Film Stage and Empire, and can also be seen directly below! There have been additional photos from War Horse popping up all day in places like Entertainment Weekly or on The Film Stage and Empire, so hit up any of those to look for more. Glad we actually got a good look! Spielberg's War Horse, based on Michael Morpurgo's novel which also became a stage play, was adapted by Lee Hall (Billy Elliot) and Richard Curtis (Pirate Radio). 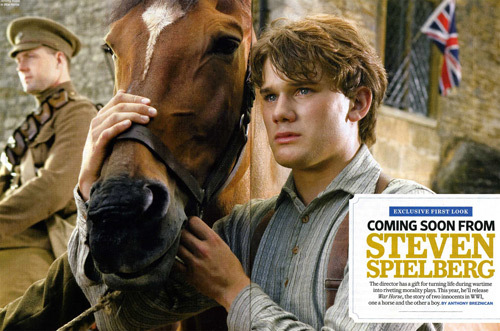 This follows a young man named Albert (played by newcomer Jeremy Irvine) and his horse, Joey, and how their bond is broken when Joey is sold to the cavalry and sent to the trenches during World War I. Despite being too young to enlist, Albert still heads to France to save his friend. The cast also includes Tom Hiddleston, Emily Watson, David Thewlis and Niels Arestrup. 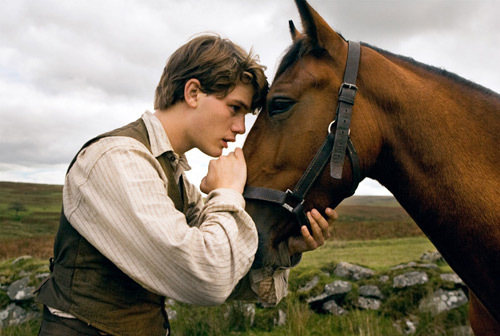 Disney/Touchstone currently has War Horse scheduled to arrive in theaters on December 28th this year. Congrats. You get a gold star for today. i'm really looking forward to this movie. looks like a wonderful story. WTF, is this released before Tintin? It's a horse. I'm going to have a tough time believing the horse feels the same feelings of detachment as Albert. Unless... they were secret lovers. Awwwww snap. It will be great to finally have a new Spielberg film out. It 's been three years since Indy came out. This could be a fantastic film. It looks and sounds great.